News in overnight from James Nason at Fraser Yachts of a further $695,000 price drop on the 36.27m sportsfisher Seacall, a joint listing with Patrick McConnell. Seacall was built by Denison in 1991 to a design by Joe Langlois. Described as the ultimate tournament sportsfishing yacht, her luxurious interior by Dee Robinson accommodates up to eight guests in a master suite, double stateroom and twin cabin. Twin Detroit Diesel engines give her a cruising speed of 18 knots and a maximum speed of 22 knots. 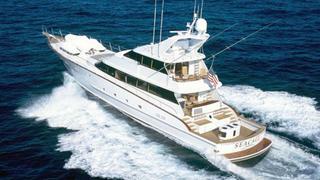 Lying in San Diego, the price of Seacall is down from $2,495,000 to $1,800,000.